Have you noticed how many people just have water these days? 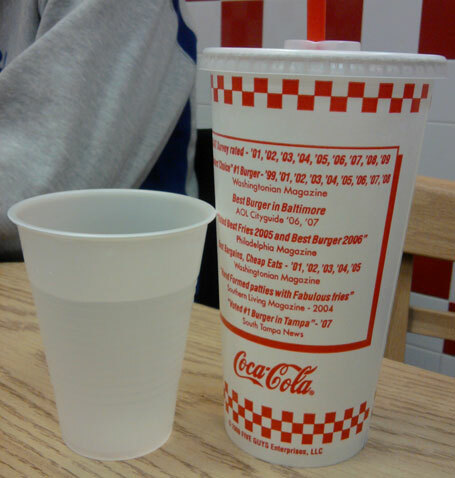 Tonight, I noticed that every table in the restaurant had at least one person drinking from the cheap-o water cups. They easily outnumbered the soda cups. BTW- I think the little kiddy cups they give you is to shame you to the world that you were too cheap to buy the real drinks. I believe it was earlier this year I saw on an article that 50% of people polled in the US said they were trying to stop or cut down on drinking soda. Apparently, that trend, which had rose from 33%, is continuing. A few months ago, I felt a little ill and the thought of drinking a soda turned my stomach. It was then I decided to stop killing myself with the brown poison and I’ve done it ever since. With a small exception of my A&W draft root beer fixes, you will be hard pressed to see a soda in my hand. I’m not sure what everyone else’s motives are but I am clear on one thing for me. I save a couple of bucks every time we eat out. I save the 85¢ once or twice a day at the vending machine. I save the $1.50 2-Liter bottle purchases at the store. It has to add up eventually. I also feel a little better now. I have less headaches, especially after I kicked the Diet Coke habit. I feel less stuffed after eating. And I feel less thirsty all the time. Water actually does satisfy the body. I’m still fat however. But that might take giving up some actual food products. And maybe a little exercise. ← Jobs are Friendship Killers.